3DHEALS Singapore – A Great Success! 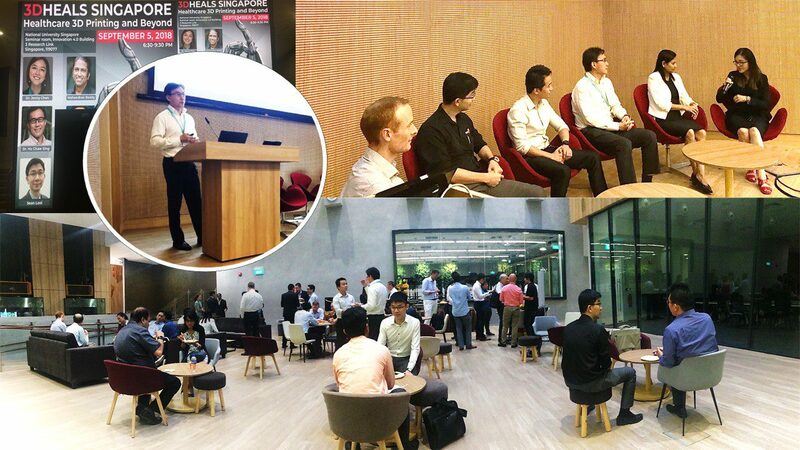 We were incredibly pleased with the turnout of the 3DHEALS Singapore, an inaugural 3DHEALS community event in Singapore. Held at 3 Research Links in NUS, the event was attended by over 50 individuals representing the public and private sectors. Dr. Ho Chaw Sing, Managing Director of NAMIC, made opening remarks. The highlights of the evening was a panel discussion comprising of distinguished speakers: 3DHEALS CEO and Founder Dr. Jenny Chen, GM of Creatz3D Mr. Sean Looi, Assistant Professor of Paediatrics, Yong Loo Lin School of Medicine, NUS Dr. Ching Kit Chen and Singapore Centre for 3D Printing @ NTU Dr. Shweta Agarwala. The discussion was moderated by clinical expert Mr. Gavin O’Neill. We have had much positive feedback from the event. Attendees were intrigued and eager to learn more about the organisation and determine ways they could help in healthcare 3D printing. They also enjoyed the networking sessions. Let‘s continue to build this vibrant healthcare!